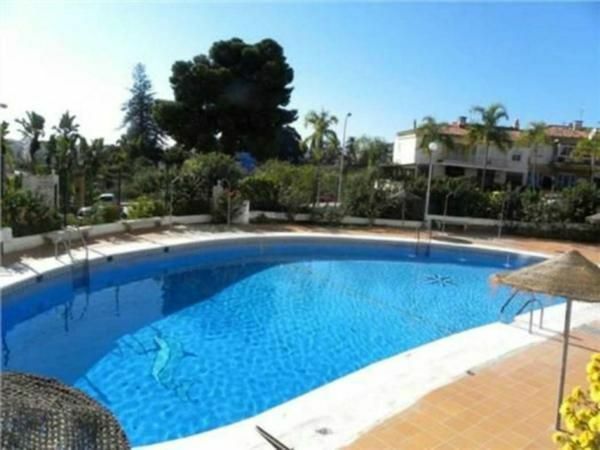 The apartment is located in a residential area, just outside the center of Almuñécar. It is located in an apartment building with lift and offers 65 m² accommodation for four people. In 2014 the property was completely renovated. Your apartment has two bedrooms, one with a double bed (1.50 mx 2.00 m) and the other with two single beds (0.90 mx 1.90 m) is set. The private bathroom has a modern shower, hair dryer, sink and toilet. The spacious living room is a sofa and a TV with satellite and DVD player and a dining table for family meals. From the window of the room, you can even catch a glimpse of the sea. In the kitchen, which is separated by a bar in the living room is equipped with a stove, oven, fridge freezer, dishwasher, microwave and coffee maker. The wireless router at home, you can use a fee upon reservation. The complex has two swimming pools. One is especially suitable for children and the second is large and a little deeper. Around the pool area are you and other residents of the complex loungers and parasols. Parking spaces are available outside the house in an enclosed area for unauthorized persons. The residential complex is located about 10 minutes from Almuñécar. Here are z. B. aquarium (the largest in Andalusia), the "Marina del Este" castle "Castillo de San Miguel" and pedestrian area of ​​the old town, with shops, cafés and restaurants. It is a place that lies between the sea and mountains and is known for the production of subtropical fruits. In this coastal region there are only fifteen beaches where you can snorkel, swim or go fishing. The surrounding shops (200 m) and a bus stop to get to town and restaurants (100 m). From here you can also make good hiking in the area, such as. These include Granada (67 km), in the Sierra Nevada or Nerja (20 km). After about 20 kilometers, you get to a golf course and the nearest airport is 70 km. Climatisation / Ventilators: according to consumption (Mandatory). Visitor's tax: no visitor’s tax (Mandatory). Cot for children: once per object available and included in price (Mandatory). Internet: once per object Costs amounting to 20 EUR (optional). Parking facilities: per object and day Costs amounting to (optional). Expenses payable on the arrival according to consumption: electricity, EUR 0.25 / kWh. : per object and day according to consumption (Mandatory). Electricity: per object and day according to consumption (Mandatory). Pet: per pet and week Costs amounting to 20 EUR (Mandatory). Cot (once per object, Costs amounting to 0 EUR). Parking facilities (per property and day, included in price 0 EUR).